It was Saturday morning and things were already getting messy. The library’s makerspace program is free to the public and is friendly to all ages, Santa Maria librarian Joanne Britton told the Sun, so Santa Marians of all backgrounds can enjoy making their own projects. But that's OK at the Santa Maria Public Library's weekly makerspace sessions, where kids and parents assembled cards and envelopes, used a silhouette machine, and painted rocks on the morning of Nov. 24. 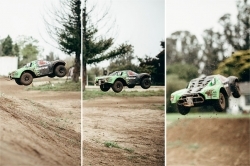 "There are no rules; I think that's the nice thing about maker: There are no rules except to be safe," Santa Maria's Librarian III Joanne Britton told the Sun. "No rules, just create." Makerspace is available at the library on Saturdays, and the program recently added Wednesday sessions, thanks to a partnership with Allan Hancock College. The whole idea of the program is to provide community access to art supplies, but also a whole lot more, like digital cameras, advanced editing technology, and even 3-D printers. 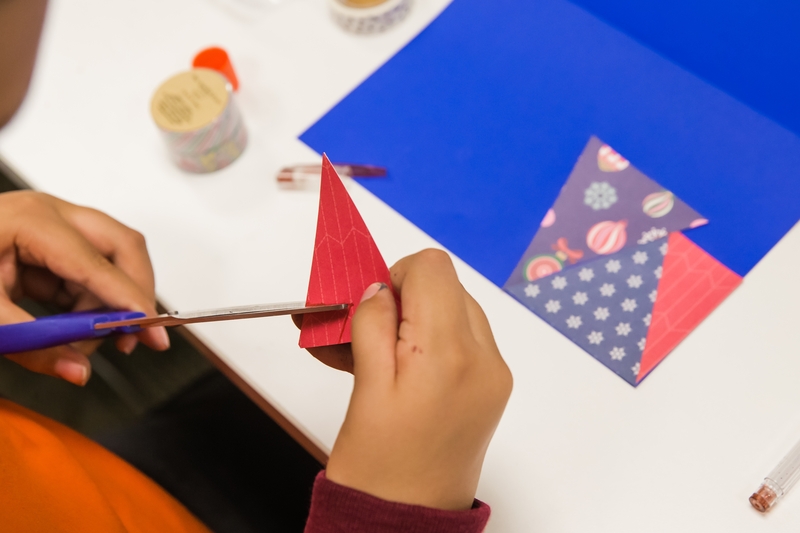 For locals who've neglected their holiday shopping, the library's regular makerspace events are a perfect opportunity to make something from scratch with the variety of materials available. The Saturday session on Dec. 15 will include a chance to make ornaments, Britton explained, for a Christmas tree or other holiday celebration. "Those are always the more special gifts anyway," she said. "I love a handmade gift." For those who put off their holiday shopping, a makerspace session could yield a personal handmade gift. The Dec. 15 program will include ornament decorating and other creative activities. Each makerspace session includes a few possible projects to work on, Britton explained. They range in difficulty, so smaller kids can enjoy activities like rock painting while high schoolers or adults can make videos with the aid of a green screen or learn about 3-D printing. Instruction and guidance are provided as well by either a Santa Maria librarian or a Hancock student worker, but visitors don't have to "draw between the lines," Britton explained. "It's just a variety of things and people can make what we suggest or they can use their imagination and create what they want," she said. "You really can't help but get involved in trying to make something. There's really something for everyone." Free makerspace sessions are available weekly at the Santa Maria Public Library through a partnership with Allan Hancock College, providing instruction in how to make everything from simple crafts to 3-D printing and design. Upcoming programs will include possible holiday gifts. The makerspace program started at the library after Hancock received grant money from the California Community College Chancellor's Office, according to the city. The program came to the library and the Santa Maria Valley Discovery Museum through Hancock so visitors could engage creatively at no cost to them or the organization. The Wednesday makerspaces, which run in the evening from 4 to 6 p.m., are a little more guided, Britton explained. Those midweek sessions are designed to help build the skills and the knowledge to help with more advanced tasks in the Saturday sessions. That's when the technology comes in too, from cameras to sewing machines to 3-D printers. "It has turned out to be a very natural partnership," Britton said. "I like to think that the library is the center of the community, a place where people can come and be free, they can explore; it's a true democracy, really. The Santa Maria Public Library offers free Winter Makerspace Saturdays from 10 a.m. to 3 p.m., including Dec. 8, which will feature sewing, cross stitch, and Makey Makey projects; Dec. 15, which will include ornament making, jewelry making, and 3-D design and printing; and Dec. 22, which will feature clay projects, rock painting, and card and gift tag making. Wednesday makerspace sessions are from 4 to 6 p.m., including Dec. 12 featuring 3-D design and printing and makerspace safety and Dec. 19 with clay sculpting and tool safety. The library is located at 421 S. McClelland St., Santa Maria. The programs take place in the first floor Learning Center. More info: (805) 925-0994, Ext. 8562. "Just to be a part of the partnership of makerspace has just really opened up a wealth of resources to the community that I don't think were really there before." On Saturdays, there's usually a more advanced project for older visitors who might have attended the Wednesday prep, Britton explained, but the library also includes something that's easily accessible for teens and kids. And a makerspace is a perfect place for youngsters to begin their first forays into hand-making gifts around the holidays, she said. "It's a really cool thing for kids to make something that they want to give to their teachers or their parents and they don't have any money," Britton added. 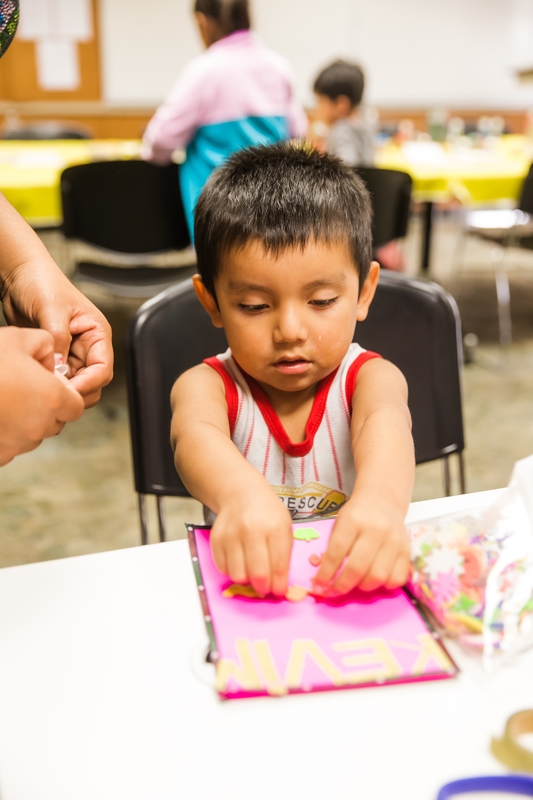 And for families that are short on cash around the holidays, the makerspace is there for them, whether it's just for their 2-year-old to paint rocks, or to make gifts for grandma. "I think that, especially for the library to provide this to low-income families, I mean, it doesn't really matter that they're low-income, everyone is welcome," she said. "It's for everyone, just like the library." Managing Editor Joe Payne has some rocks to paint. Reach him at jpayne@santamariasun.com. Want to make a candle for a loved one? It’s easy with a candle-making kit of your own. Most beginner kits, which are readily available online, include wax, scents, jars, wicks, a thermometer, melting pitcher, and, most importantly, very clear instructions. All the holiday season burnouts, last-minute shoppers, and broke kids with mothers who deserve better know that candles (almost) always make decent gifts. They look nice, smell even better, and most everyone loves the warm and fuzzy vibes of a candlelit room–especially during these dark, depressing winter months. But maybe you've bought a certain special and difficult to shop for someone a candle several years in a row. Or perhaps you've decided a "decent" gift isn't good enough this time around. In that case, make your own. Handmade candles are totally customizable, and once you have the necessary supplies and instructions, the process can be pretty fun and easy. The products sold at Parable Candle Company are handmade, and customers can customize gift baskets, or learn to make their own soaps and candles by booking private parties. Candle-making kits are readily available online, and typically range from about $40 to $70. Most beginner sets include all the supplies you need to make basic–but cute–candles, and once you have the base tools, all the fun add-ons are fairly inexpensive. My kit (which I did not buy, but borrowed from my boyfriend, who went through an extensive "candle-making phase" as a child) included wax, scents, jars, wicks, a thermometer, melting pot, and, most importantly, very clear instructions. The best part of making my own candle was finding a container. I used mason jars and an espresso cup (a coffee-themed candle for a coffee lover!) this time around, but emptied wine and beer bottles, Christmas mugs, and plant pots would also make great holders, perfect to spice up someone's kitchen, seasonal decor, or patio. Come to think of it, a candle-making kit itself would actually make a great gift for a very crafty, or very bored, friend! But if you're not uber confident in your candle-making skills, (and why would you be?) 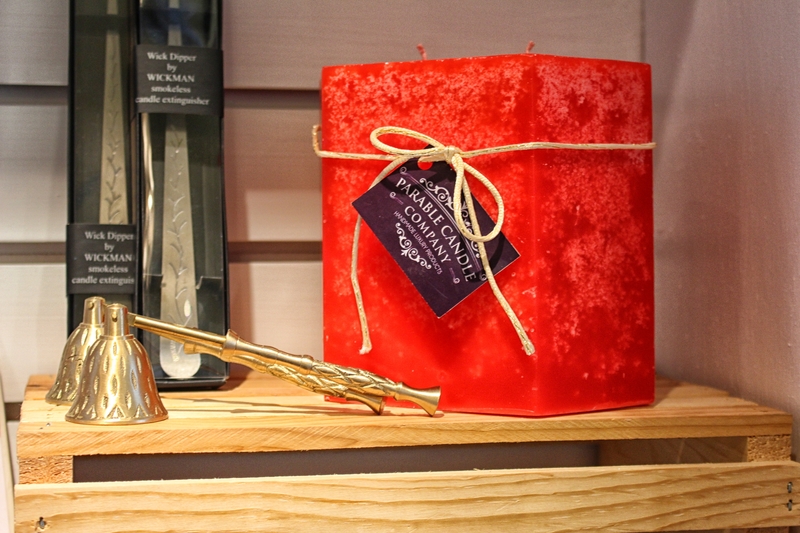 you could always give the gift of a candle-making experience led by a professional. Elaine Bumanglag, owner of Parable Candle Company, hosts private candle- and soap-making parties. It's just like the wine and painting thing, but without the booze, and with amazing smells! Each class costs about $22 per person, and participants get to make and take home their very own fancy soaps and candles. 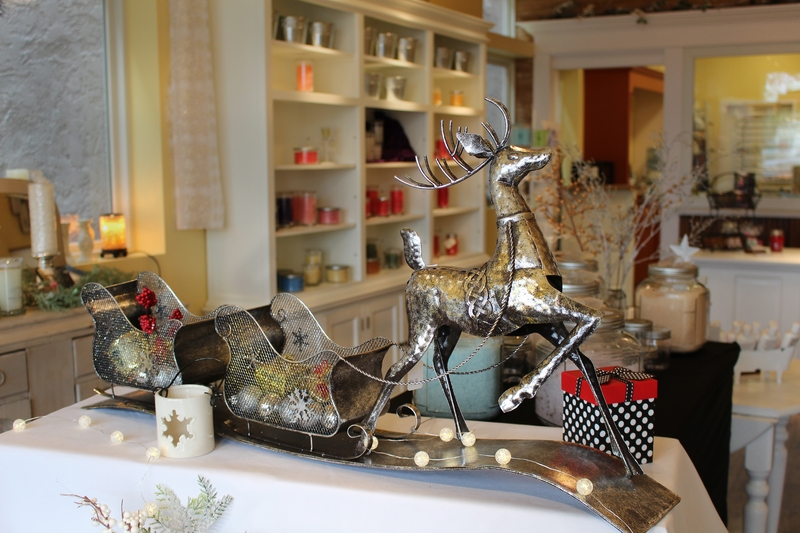 Parable Candle Company, located at 125 Union Ave., Orcutt, is decked out and ready for the holidays. Owner Elaine Bumanglag plans to host several public candle and ornament making workshops throughout December. Bumanglag said she'll also be hosting a few public holiday-themed workshops this December. At the classes, which will cost between $15 and $18 per person, participants will learn to make chunk candles and beeswax ornaments, and will be able to choose from scents like snickerdoodle, apple cider, and evergreen with berries. The dates for those workshops will be announced on Parable's Facebook page, Bumanglag said. She also sells customizable gift baskets–a hot ticket item this time of year–for about $40 a pop at her Orcutt-based shop. Customers can choose from an array of beautifully handmade candles, soaps, bath bombs, and oils. Bumanglag started making her own products about three years ago, just after she was diagnosed with advanced Lyme disease, an ailment that forced her to stop working full time as a nurse. The candle-making process is something she can do between the many rests her illness demands, so each product, as with most handmade gifts, is truly made with love. "They're perfectly imperfect," Bumanglag said. No matter what path Olive Cadwell took in her life, she knew it would eventually lead her to soap. "Even when I was in college, I just felt drawn to it," she said. "As a kid, it was something I was very interested in." Today Cadwell is the owner and creator behind Body HI, a Lompoc-based company that specializes in cold process soaps, bath bombs, and lotion bars. Her products utilize her own formulas of organic and locally sourced ingredients. Cadwell started her company five years ago and has since racked up a loyal social media following as well as retail partnerships in California, Hawaii (where she studied her craft), and beyond. Olive Cadwell’s line of organic soap and skin care products come from years of perfecting her techniques and formulas. For those looking to try their hand at it, Cadwell recommends a lot of patience. Take a moment to search the internet for homemade beauty products and your head will start spinning. There is a vast culture of bespoke beauticians and skin care specialists adamant on rejecting corporate manufactured beauty products, filled with chemicals sketchily approved by the Food and Drug Administration. There is a huge market for natural and homemade beauty products; according to the Handcrafted Soap and Cosmetic Guild, there are more that 200,000 home-based artisans working in the United States alone. Places like Lompoc and its surrounding communities are on board with the trend. 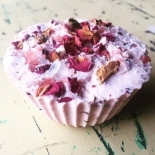 Cadwell's website and social media are populated with her products, everything from lavender and sweet basil soap to vegan coconut rose bombs. For her, getting started in the business was a product of passion and trial and error. "The first few times I did it there were a lot of mistakes," she explained with a laugh. "Mostly it was because I didn't take my time. It requires a lot of patience to make soap." In the simplest terms, the process involves pouring a carefully measured mixture of lye and soap along with a unique blend of oils, butters, fats, and scents into a pre-formed mold. The mixture is then cooled and, when completed, cut from the mold. Patience is the No. 1 skill Cadwell suggests for those looking to enter the soap-making arena. The proper tools area also essential. Some soap makers such as Cadwell utilize the cold prrocess technique, which combines oils such as coconut, palm, or olive oil, with a chemical agent such as lye (sodium hydroxide). In addition, necessary equipment includes: thermometer, mixing bowls, scale, gloves/eye protection/mask (for the lye/sodium hydroxide, which burns skin), soap mold, stick blender, silicone spatula, and double boiler. Some artisans opt to use their microwave to melt the hard oils and butters. Also, Cadwell said optional ingredients include natural colorants such as clays or organic powders. Cadwell doesn't just make soap. 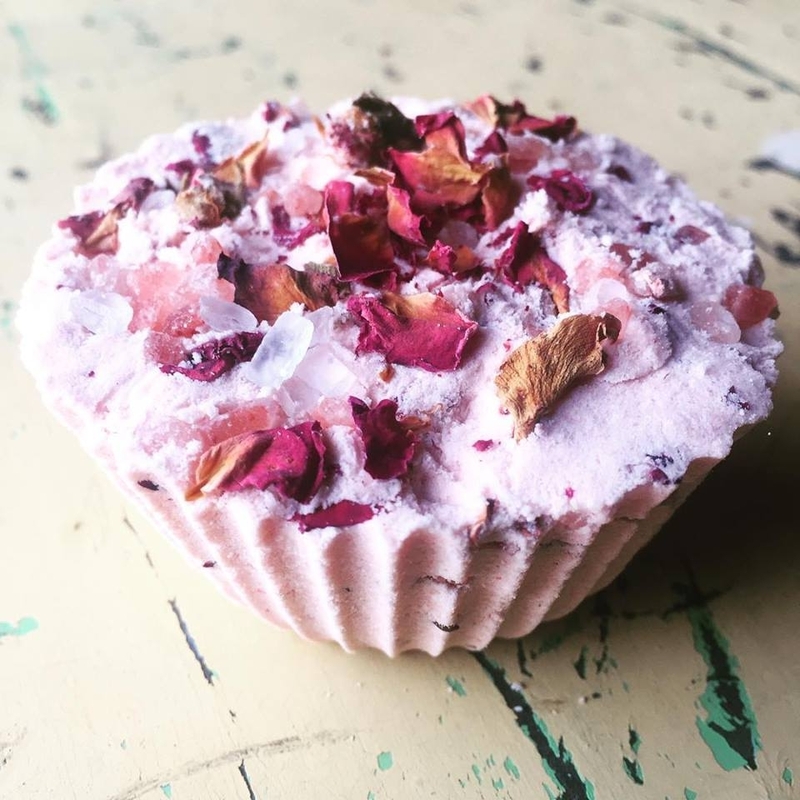 Bath bombs are an increasingly popular product for her and other artisan beauty product manufacturers. "Bath bombs are a lot like baking minus the actual baking part," Cadwell said. "You need to be very exact with your ingredients or else you can end up with a failed volcano science experiment." The product involves mixing dry ingredients such as herbs, flowers, clays, or citrus peels with wet ingredients such as oils (for moisture), water, or other scents and liquids. She said the key to bath bombs is adding the wet ingredients slowly to avoid causing the product to erupt. Her bath bombs include Orange You Glad, an orange and vanilla scent, which she described as smelling similar to a creamsicle; Coconut Rose, made with geranium rose essential oil, organic rose petals, and coconut extract; and Kate's Garden, a bath bomb with lavender, rosemary, and lemon oils she developed from organic herbs and flowers from a florist's organic garden in Big Sur. Cadwell likens the experience of using bath bombs to being immersed in a large mug of tea. "Not only is your skin getting the benefits of soaking them in, but it is aromatherapy as well," she said. "Generally speaking, they are easier and faster than making cold process soap, and are actually a fun project to do with kids." Arts and Lifestyle Writer Rebecca Rose is the star of her very own soap opera. Contact her at rrose@santamariasun.com. Full disclosure, I tried to be Ron Swanson and make my beautiful life partner a gift for the holiday season, but unfortunately, I am not Ron Swanson. My first attempt at building a headboard for our bed ended in a bunch of bent nails and broken self-esteem. I tried to simplify the next gift (a chair) but apparently restoring old rocking chairs is just as hard as Mel Gibson in The Patriot makes it look. I didn't even get to sit down in mine. My last failed foray into holiday inspired carpentry involved a bathtub caddy–which is pretty much a bath kit that you can use to hold your glass of wine or something. Anyway, I bought a few two-by-fours and some pieces of cedar roughly the width of the tub and then got home and realized I needed a table saw. Not only do I not own a table saw, but I'm far from having the requisite skills to operate one without ramming one of my fingers against the blades. I'm not a good carpenter. Maybe I will be someday, but for now, the only thing I can do with wood is chop it up for fires. The realization of this fact gave me an idea: Why don't you just burn something? If you’ve destroyed that impossible-to-assemble IKEA table, barbecue ribs are a solid last-minute gift around the holidays. 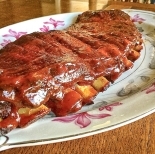 And not just anything, but sweet, delicious baby back pork ribs, smothered in spices and maybe topped with a homemade sauce. So I went to the store. 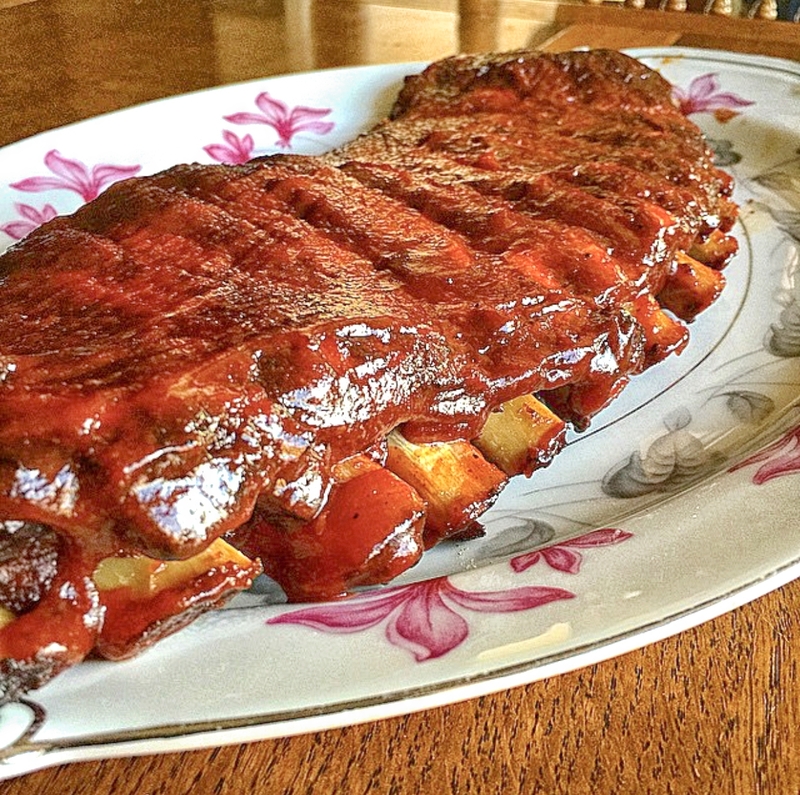 You can usually pick up a couple racks of baby backs for around $20 to $30 on sale. I comb through local stores like I'm Bob Belcher and need to speak with each rack. "Where did you come from ribs? What are your goals? Dreams? Where do you see yourself in five years?" It didn't take me long to find the one. Well two. On this day, the final price tag came out to $24.50, and while the price wasn't great, the store I bought the two racks from was right next to a Christmas tree nursery (hey, themes!). So I packed my car full of soon-to-be-smoked meat, a pine tree I can replant in the spring (because we're those kind of people), and applewood for smoking. I was ready. It was time to grill. First, I got home and lit a small fire on one side of my Weber grill. You can use a grill of any size, as long as it's charcoal based. If you only have a gas grill or an oven to use, I guess that's OK, but you're wrong. You also need to cover the grill, so Santa Marians, avert your eyes. You don't want the fire to be too big because the game here is low and slow. In all, the ribs should cook for about four hours, so you'll periodically add to the fire as you go. After I did all the fire prep, I went inside and unpackaged the ribs. I usually tear and cut away the membrane on the bottom (bone) side of the ribs before I do anything. Next is the rub. My rub is a combination of brown sugar, paprika, cayenne pepper, dried jalapeño, salt, cumin, garlic and onion powders, and sometimes chili powder or dried mustard. For the sauce, I used a combination of those spices with apple cider vinegar to be cheap, but I've done a recipe that used several cloves of smashed garlic, apple cider vinegar, red pepper flakes, and tomato paste that is pretty damn joy inducing. My extended family in Texas will tell anyone they meet that ribs aren't supposed to be sauced, but this is California and if we want to put sauce on dry rub like we're in Kansas City, Memphis, or North Carolina, we can and will. Blame it on our coastal elitism. We just don't know any better. The sauce is simple: Bring ingredients to a boil and then simmer for 15 minutes. My advice is don't chase thickness, you just want consistency. A whisk is your best friend here. The sauce is something you tackle in the last 15 minutes. At least 90 percent of barbecuing is sitting around and waiting, so I encourage finding other things to do in your down time (maybe enjoy some yuletide libations or perhaps one of those terrible Lifetime movies). Whatever you do, just don't forget to monitor the fire and keep the temperature around 225 to 250 degrees. You'll first start your fire with charcoal and then slowly shift in pieces of the applewood until the ribs are done. The time to cook them depends on the heat of the fire. This time, it took me about four hours on the money. The results were not disappointing. I had made something beautiful. And even though I was probably going to eat her gift before my partner got home, I couldn't feel too bad. Staff Writer Spencer Cole is always available to eat ribs. He can be reached at scole@santamariasun.com.